Discussion in 'Z32 Technical' started by Zeo, Jan 30, 2019. There used to be a list of deletes that you could do with the engine still in the car and with the engine out. I can't seem to find it, could someone either point me to it or put up a list please? Cheers. The Z engine bay is a complicated mess of wires and vacuum hoses. Nissan over-engineered many of the components, usually because of compliance issues to federally mandated emissions laws. Now would be a good time to review this site's Disclaimer. Certain show car persons are always striving to keep their vehicle as original as possible, so this page will not be helpful to them. When it comes to older cars, I am a big believer in simplification. The procedures listed here make future trouble shooting easier by eliminating unnecessary, old, cracked, rubber vacuum lines and their potential leaks which can be a maddening source for an engine not running right. Getting rid of water hoses under the plenum prevents future coolant leaks. Doing without unnecessary solenoids and electrical harness connections prevents corrosion associated problems. Overall, these steps save weight, yield more space to work under the hood, and make doing other routine work on the engine much easier. None of the procedures listed here will cause the car's ECU to throw an error code, with one exception. An EGR delete can trigger the Check Engine Light (CEL) on the dash, on '95 and '96 Z's. There is an easy work around for that by splicing a resistor into the circuit. After an EGR delete, a plenum pull goes from being a knuckle-buster to a walk in the park. When replacing rubber vacuum hoses, use silicone instead, which stays soft and pliable over the years and comes in some nice colors. I have been happy with Hose Techniques. There are other companies as well. Click on the headings below to see each procedure in detail on their own page. This is a summary page for those who want to see an overview of all the crap that can be pulled out of an engine bay without sacrificing safety and performance. I have tens of thousands of miles of experience on my own car with most of these mods, along with feedback from many other readers. Key point, and I get asked this all the time - removing the CC does NOT effect performance or exhaust emissions in any way. 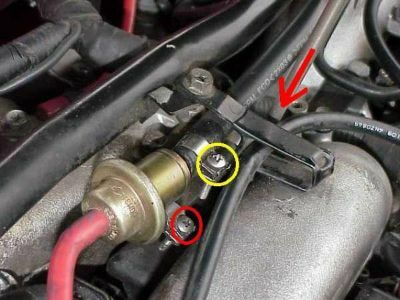 Read the article which explains how to do a bypass around the CC in just a couple of minutes without pulling the front fascia, which is useful for troubleshooting. Better yet, do it right and get rid of all that crap. You get brownie points for just knowing that PRVR stands for "Pressure Regulator Vacuum Relief." Best timed with an engine pull. After an EGR delete, an upper plenum pull goes from being a knuckle-buster to a walk in the park. Plural because there are two of them, on 1990-1992 z32's only. Nissan deleted them after that which should tell you something. There is also an AIV article for the z31 on this Web site. I am lacking the "how to" part on this mod. Read about the real reason this system exists then decide for yourself if you need it or not. I have driven my Z in some very cold PA winters for years after this mod without issue. No worries. Pre-cats are worth a special mention. They are a horrible choke point on the Z engine exhaust. They bolt up to the turbochargers and contain a small amount of catalytic material. Replacing them with just about any brand of aftermarket downpipe will free up some very noticable horsepower, mainly by allowing the turbos to spool up at a lower RPM. The pre-cats' job is to control emissions while the car is warming up. The car will pass emissions testing without the pre-cats, as long as the main catalytic converters further downstream are retained. Here is potential for some real weight savings. Considering that my spare tire won't even fit over my aftermarket bigger front brakes, right away I am down to a 50/50 chance that I can even use the spare tire in case of a flat. Since most flats are caused by repairable punctures, carrying around a repair kit and a portable air compressor is the alternative I have chosen. There are two bleed points for the clutch, one on the slave cylinder under the car, and one under the hood. Besides rattling against the underside of my hood, the only real purpose I can tell this bleeder served was to make bleeding the clutch much harder than it needed to be. The HICAS system is the four wheel steering on the Z. HICAS stands for "High Capacity Actively Controlled Suspension." The 1990-1994 Z's had hydraulic HICAS and the 1995-1996 model years were electric. There are lots of under hood and under car components to the HICAS. I like the HICAS system. I believe it makes me a better driver on the track. However, when the HICAS craps out, the most cost effective repair is to eliminate the HICAS. An aftermarket HICAS elimination bar has to be purchased to lock up the rear end. My HICAS never failed so I do not have any instructions for the delete yet. I do not know enough to recommend for or against deleting the fuel damper. Some Z owners seem inclined to delete their damper when they are upgrading the fuel pressure regulator. I left my fuel damper alone. There are plenty of folks who are running without one who do not seem to be having any problems. Again, I do not know enough about this component to recommend whether or not to delete it, but anecdotal evidence would indicate the 5-speed trannys shift fine without this system. Sure, you can pull your air conditioner, cruise control, stereo, whatever you want. I am not about that. I like my creature comforts. I've noticed that many folks who want to delete items for weight savings would do better to concentrate on the "Dunlap" around their waistline, lol. A ten pound weight reduction usually results in a one horsepower gain. These cars are pigs when it comes to weight. That's one of the main reasons I think the z32 is more accurately classified as a GT (Grand Touring) car rather than a sports car. littlechicken and Zeo like this.